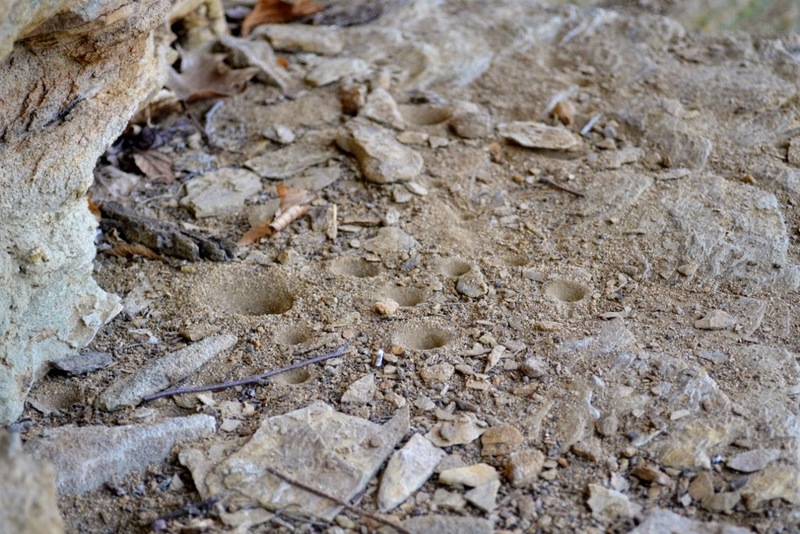 The sand that weathered from these sandstone ledges has provided a great place for antlions to thrive. 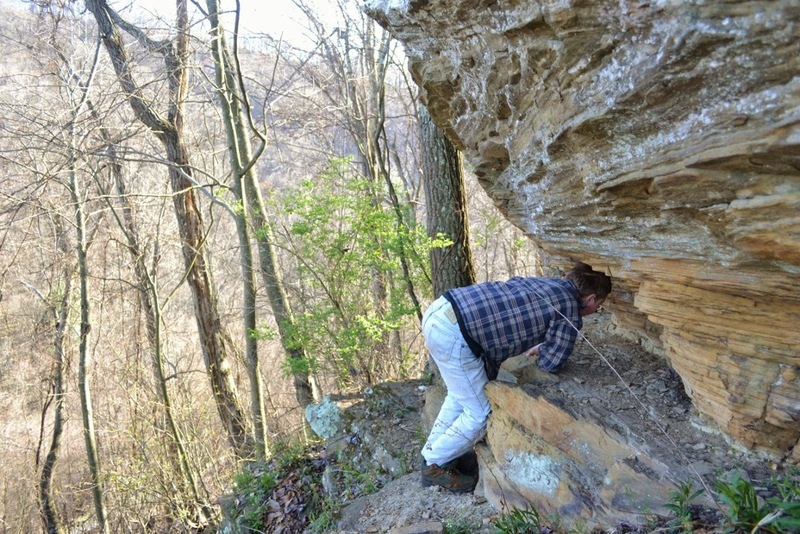 Oh, the drama we've seen among the rock's sandy little grottoes and niches... it's no wonder we stayed awhile. 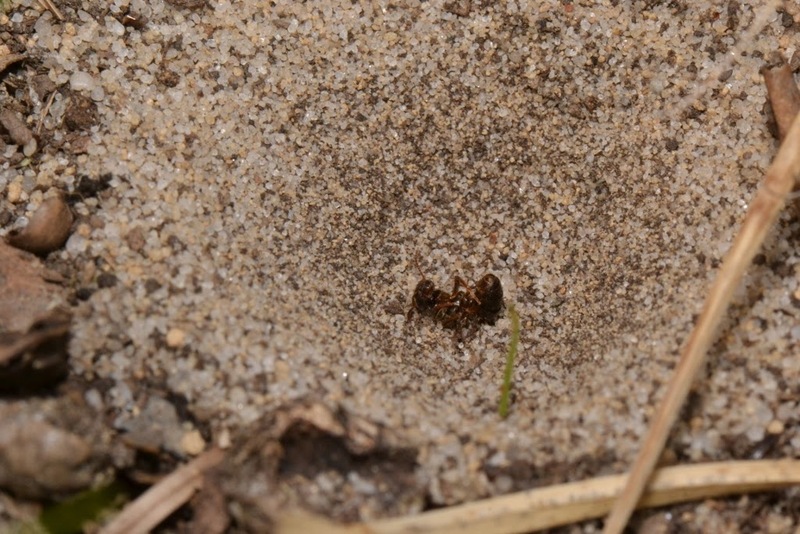 We've watched the antlions construct their little funnel-shaped pit-traps in the sand on the protected ledges. 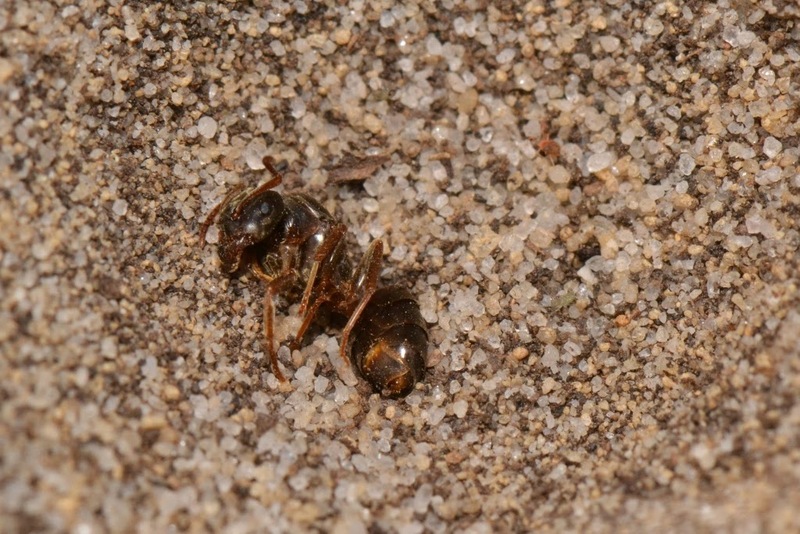 We've also seen hapless ants and other insects lose footing on the loose sand of the antlion's pit traps and fall prey to the well-hidden antlions. 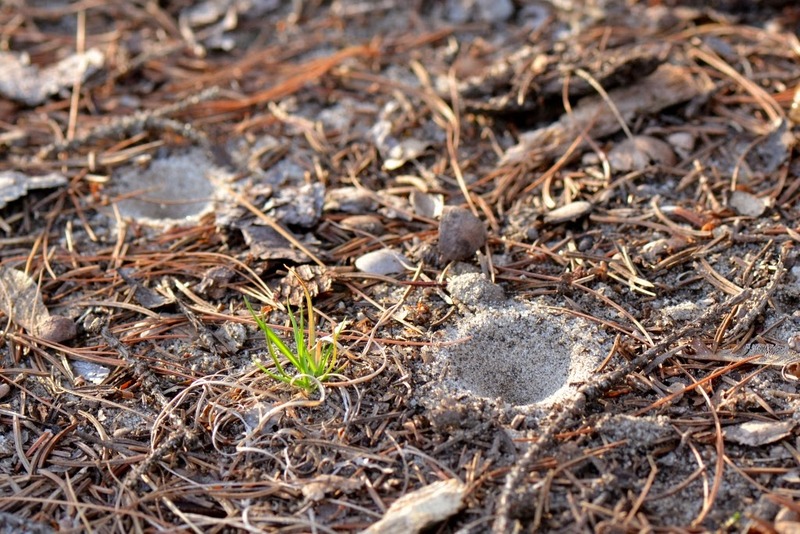 Here are some photos of those cone-shaped pits that antlions dug in loose sand. Actually, antlions construct their pits with many quick flicks of their heads - using their jaws like shovels to toss some grains of sand up and out. 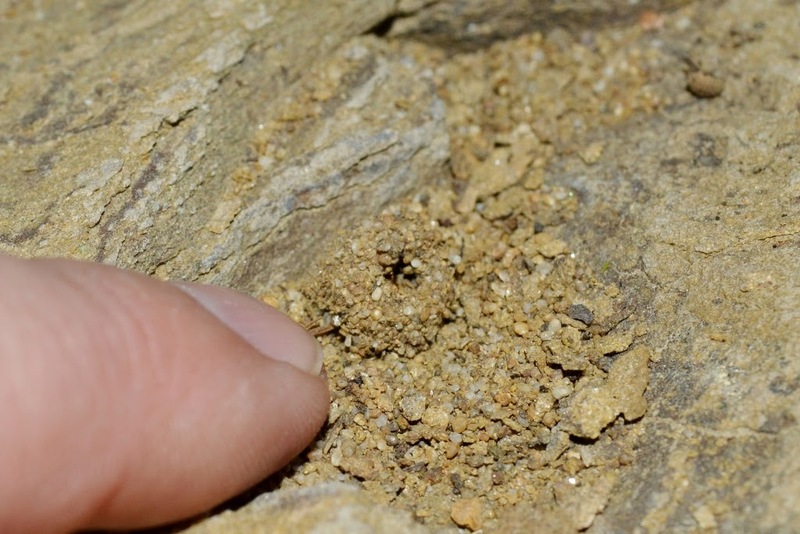 In the bottom of one pit I spotted an ant that had lost its footing on the steep pit sides and had fallen victim to the lurking jaws of an antlion. Here is a close-up of the antlion's prey. I could catch glimpses of the antlion's appendages as it moved the ant around. 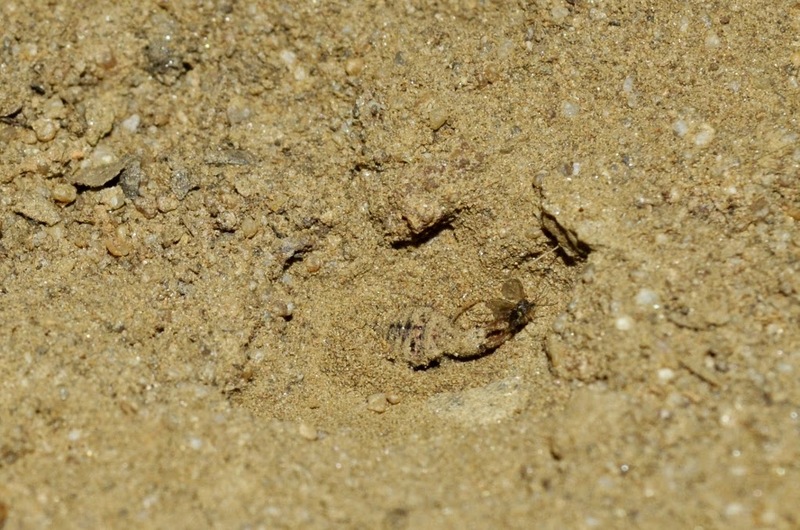 Here is a photo of an antlion that I exposed by gently blowing away the sand in the bottom of the pit. Usually the antlions are hidden under the sand in the bottom of their pits awaiting some insect that might fall into their trap, but here the antlion's jaws are visible as it lies in wait. 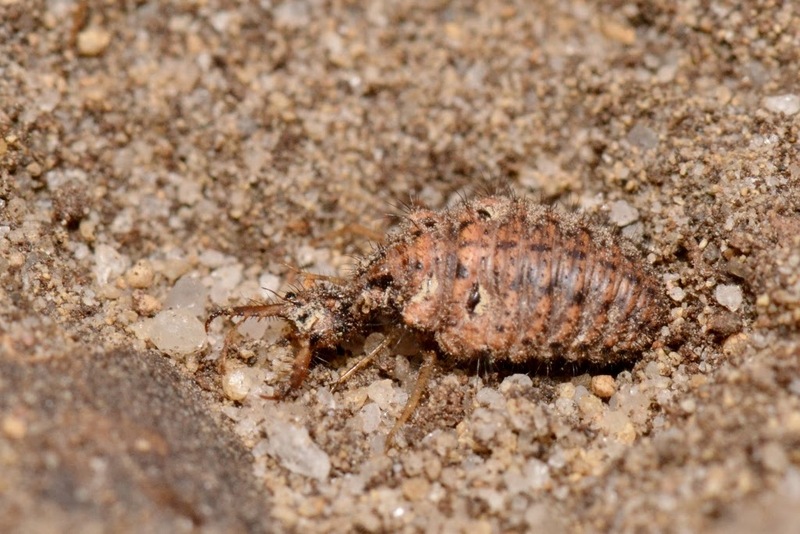 Even winged insects can be trapped in an antlion's pit-trap. 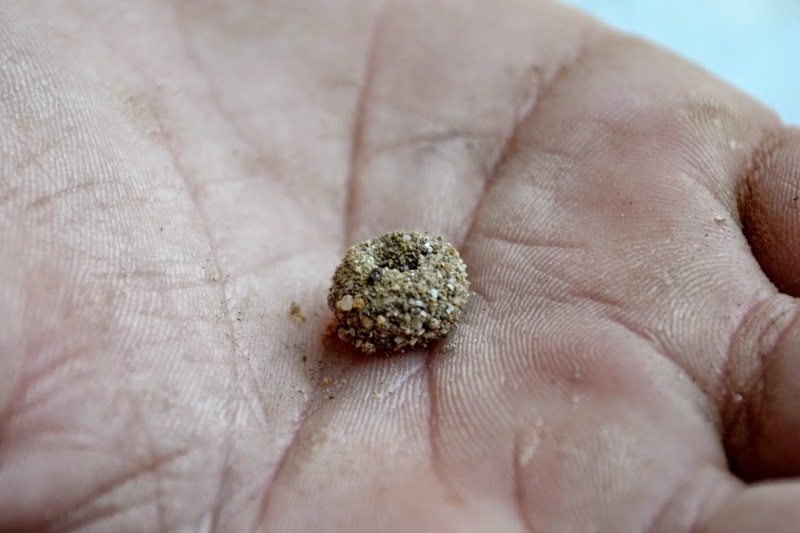 We blew away a few sand pits in hopes of finding some antlions to photograph and in the process found some antlion pupal cases. The antlions pupate in these spherical cocoons they construct of silk and sand. I'll have to leave posting about adult antlions until I find my photos. On second thought, I may have to hang out on those ledges until I get to photograph adult antlions emerging from the sand. Fascinating as usual Dana. 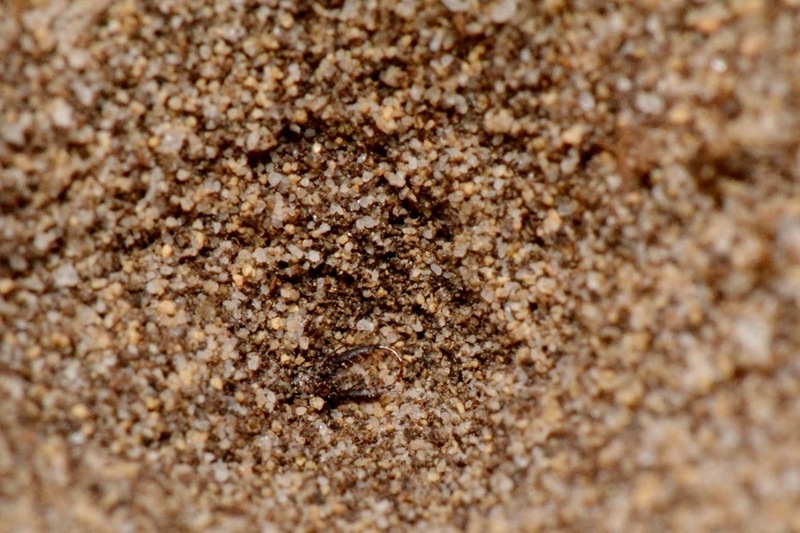 The image of the Antlion's jaws protruding (just barely) from the sand is a tad creepy. Made me think of a scene from Star Wars where Luke was going to slide down a similar sandy slope into the jaws of a monster.